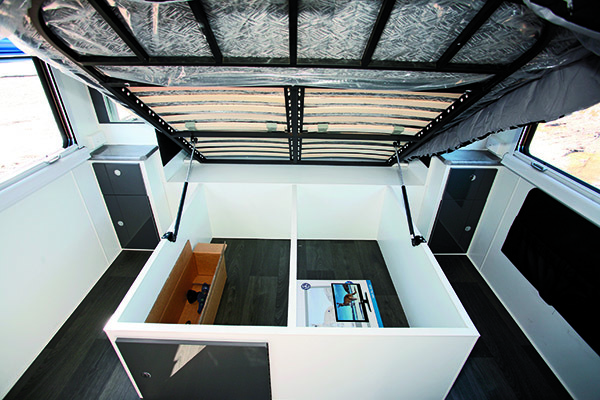 North of Brisbane, Qld, around Burpengary and Caboolture, there is a burgeoning number of caravan dealers located along the service roads of the Bruce Highway. That, of course, is very handy for caravan buyers who can simply cruise the strip in their search for a new caravan. And it’s equally handy for an RV journalist doing caravan reviews – a one-stop shop, you might say! 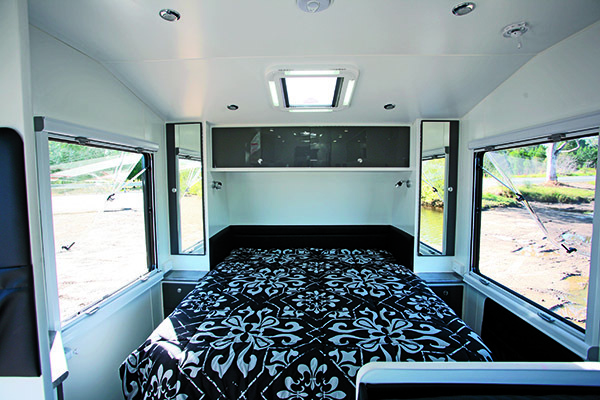 This time around, I picked up an Oz Cruiser Grand Tourer 1960 (GT 1960) from River City RVs in Burpengary. Something that always pleases me when arriving at a caravan sales yard is to find a clean review caravan hitched up and ready to go. And although director Matt Blackburn wasn’t there, he still made sure that everything was organised for me. My tow vehicle was a Ford Ranger and, with its 3500kg tow capacity, it was a good match for the GT 1960, which has a Tare mass of just 2040kg and an ATM of 2840kg, giving it an impressive load capacity of 800kg. What this also means is that, with a bit of careful packing, the loaded weight of the GT 1960 could well fit under the more popular 2500kg towing limit, making it towable by a good selection of vehicles. The van has an external length of 6m (19ft 8in) and given its ground clearance, DO35 hitch and black checkerplate cladding (always a good clue), you can tell just by looking that it’s been designed with offroad travel in mind. Underpinning the GT 1960 is a black DuraGal chassis with both 150mm (6in) RHS drawbar and chassis rails. This rides on independent coil spring suspension and 16in wheels, each fitted with shock absorbers. To keep the balance reasonable, the two 90L water tanks are fitted fore and aft of the tandem axles. Both the Manutec jockey wheel and the quick-drop corner stabilisers make setting up easier. The body consists of an alloy frame, with insulation installed underneath the external aluminium cladding. Eurovision acrylic windows are fitted all-round and the Aussie Traveller security screen door comes complete with a top-half window. A notable mention in the overall structure is the thermoplastic composite sandwich panel floor, which has a honeycomb structure and fibreglass polypropylene face sheets. The idea behind this is to move away from a plywood floor to something that weighs less but has a similar, or better, strength factor and is weatherproof. On the nearside, the awning provides good cover for the picnic table, which has 240V and 12V outlets, as well as the gas bayonet fitting for a barbecue, allowing you to make the most of life outdoors. Up front, the unencumbered tunnel boot offers plenty of external storage capacity. Having a forward entry door in a van of this length allows for a comfortable front bedroom and full-width bathroom layout without anything feeling too squeezed in. There’s a good-sized kitchen bench along the nearside wall and a cafe dinette opposite. Large windows all-round provide a feeling of space as well as plenty of natural light and ventilation. The black and white colour scheme is offset by the glossy grey laminates of the cupboard doors. 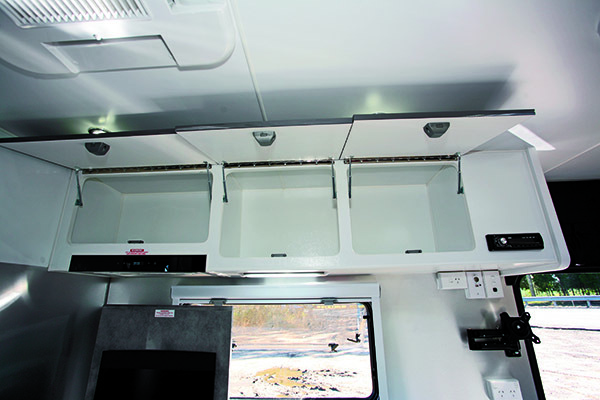 Apart from the roof-mounted Aircommand Ibis air-conditioner, much of the ceiling is filled with medium-sized skylight hatches and LED downlights, so there’s plenty of light – by day or night. Starting at the rear, the bathroom has a fairly standard look about it with a shower cubicle on the nearside and a cassette toilet opposite. A vanity cabinet fills the remaining rear wall area and houses a wash basin, 2.5kg top-loading washing machine and both cupboard and drawer space. Extra storage is supplied by overhead cabinets and there’s a good-sized wall mirror. The sliding door closes the bathroom off when necessary. Directly outside the bathroom is the 185L fridge with a microwave above and storage lockers above and below. This leaves space on the nearside for a reasonable length of kitchen bench. The GT 1960’s kitchen has a generous amount of variously-sized drawer space plus two cupboards. While one of the cupboards is in the conventional position under the sink, the other sits at the end of the bench, facing the entry door. This cupboard is hinged so as to be easily accessible from inside, but you could debate as to which side would be more convenient! Those who enjoy an alfresco lifestyle might prefer the door hinged so that it’s accessible from the outside. Perhaps a roller-shutter door might be a happy compromise? 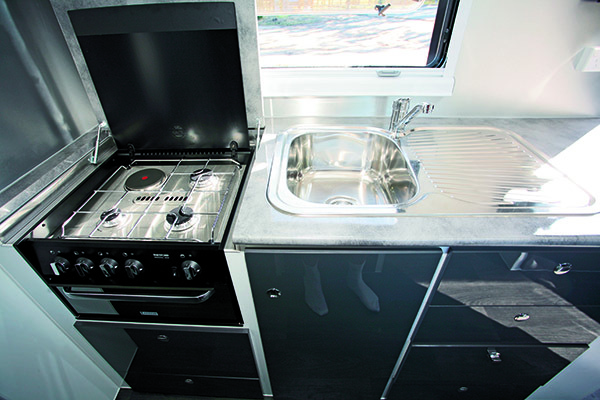 Cupboards aside, the kitchen bench comes with all the usual facilities – a four-burner cooktop and grill and a stainless steel sink with drainer. And as a bonus, there is still a bit of benchtop working space. As is usual in a caravan layout like this, the wall space near the entry door has all the entertainment facilities, including a radio/DVD player plus a flatscreen TV mounting bracket. Also fitted here are the necessary 240V and 12V sockets plus the TV antenna connections and the light switches; however, the location of the latter is a bit awkward when the TV is in position. Directly opposite, the black leather-upholstered cafe dinette has a tri-fold table with a cupboard underneath, LED reading lights and comfy seats. Both 240V and 12V sockets are fitted to the wall above the table. Floor locker doors give access to the under-seat storage areas, with the rear locker taken up by two house batteries. Up the front, the innerspring mattress bed sits on a metal-frame, posture-slatted bed base. It can be easily lifted to get to the under-bed storage, but there’s also a door at the end of the bed for quick access. There isn’t a front window but large windows on either side provide a good cross-flow of ventilation. 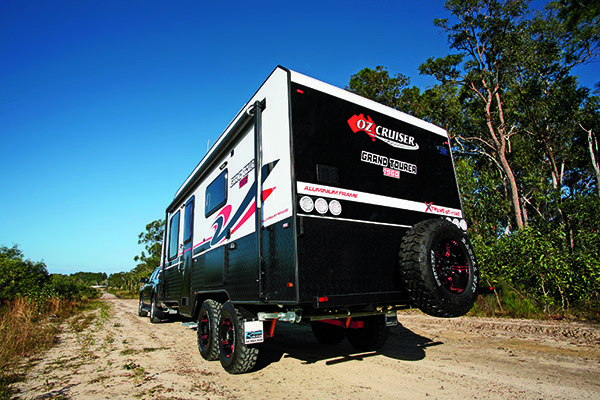 Overall, the Oz Cruiser GT 1960 seems to be quite well set up for offroad and remote area travellers. It has certainly been designed with offroad or rough-road travel in mind, evident not only in the high ground clearance and independent suspension but also in the features and fittings – such as the good solar and battery capacities – that lend themselves nicely to extended remote stays. In addition, the GT 1960 is a reasonable length for towing offroad and its large load capacity is certainly a bonus for packing all your goodies for remote touring.